Apologetics Press - What Do Creation Geologists Do? Sadly, many people through the centuries have not believed in Noah’s Flood. Since people lived much longer lives before the Flood (hundreds of years, Genesis 5), it is easy to imagine that there could have been millions of people on the planet when Noah tried to convince them about the truth of the Flood, and yet no one believed him except his family. How wrong those disbelievers were! Today it is similar; people who believe in the global Flood of Genesis 6-9 are far outnumbered by those who do not. That means there are more scientists studying the Earth who incorrectly interpret what they find, because they are working from the wrong starting point, since they do not believe in Creation and the Flood. These events would have affected the Earth and the results of geologic study in a major way. 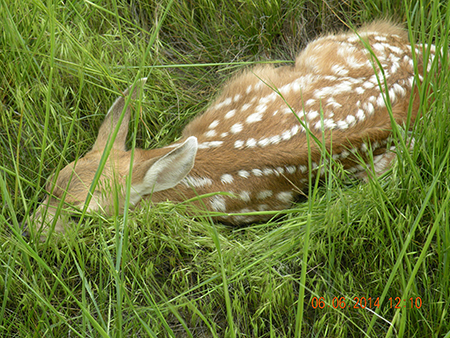 We almost tripped on a baby deer hiding in the tall grass. We need more scientists who believe what the Bible says, and who will study the Earth from that viewpoint and defend the truth of the Bible: geologists, astronomers, physicists, biologists, paleontologists, zoologists, engineers, chemists, thermal scientists, doctors, and others. Have you thought about becoming a Creation scientist? We especially need Creation geologists and paleontologists. What do they do? 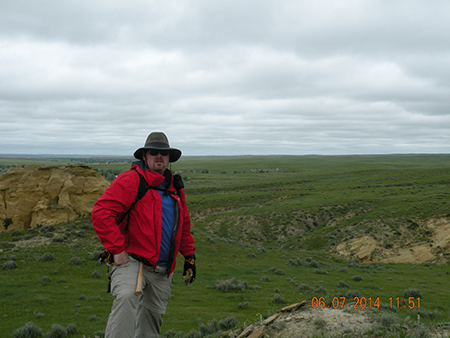 On my recent trip to Wyoming, I was able to work with a Creation geologist firsthand. In order to study the layers of a rock formation known as the Lance formation, we needed to find places in the Lance area where the rock layers could be seen. That usually happens in creek and river canyons, and so we wanted to walk down Lance Creek and the other area creeks. The creeks, however, went through several ranchers’ lands. So we went to the courthouse and studied maps to find out whose properties we would need to cross, got their addresses, and went to ask them permission to walk across their lands. After that, we were able to study special geologic maps that show where the hills and valleys in the area were to get a better idea of where we might be able to see rock layers. We then spent several days walking along creeks and up and down canyons (avoiding snakes, prickly pears, Yucca plants, cows, sheep, pronghorns, jackrabbits, prairie dogs, deer, and sliding off cliffs), looking at the different layers, measuring their thicknesses, using GPS to track where we were on the geologic maps, studying the overall tilt of the land across the whole area, and jotting down notes in a field journal about what we were seeing. If we saw anything that stood out as important (like a seismite), we would make careful notes about it. We would also take pictures to document what we saw. At night, Dr. Wise would piece all of the information together from the canyons we hiked to see how the features of the whole area fit together. From that, we were able to map the layers of the Lance across several miles. While geologists study the Earth, paleontologists study ancient life, usually in the form of fossils. Paleontologists have to be both geologists and biologists since they have to understand life, as well as the Earth and its processes. Dr. Wise is a paleontologist. Another Creation geologist that I was able to meet and learn from was Dr. Art Chadwick, one of the world’s most famous dinosaur fossil hunters. 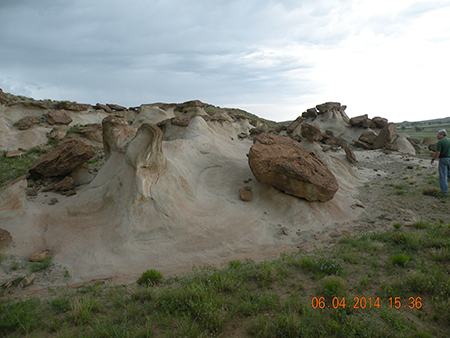 He has excavated over 17,000 dinosaur fossils from one ranch in the Lance area. 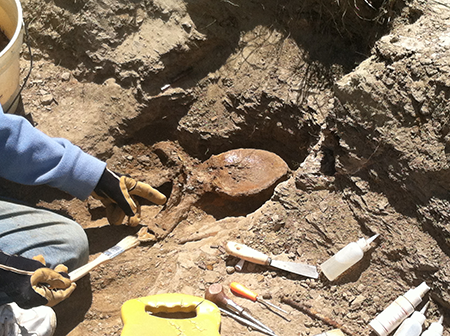 How do scientists such as Dr. Chadwick dig up dinosaur bones? First, you have to know where to look. A lot of dinosaur fossils are known to be found, for example, in the Cretaceous (kruh-TAY-shus) layers of the geologic column. Triceratops are often found in the Lance formation layers, which are a section of the Cretaceous layers. Unfortunately, unless you happen to live in an area where the Cretaceous (or Jurassic or Triassic) layers have not been eroded (washed or blown away), you probably will not be able to dig up a dinosaur fossil in your backyard. Dr. Chadwick and his students carefully dig away mudstone, inch by inch, in the places they believe a dinosaur fossil would be, using special tools, kind of like dental tools, as well as putty knives and paint brushes. When they find a fossil, if there are cracks or weak spots in it, they are cleaned and glued with a special glue. Once the dirt has been cleared away around the fossil, an expensive GPS unit is used to map where the bone is, as well as its shape and dimensions. The fossil is carefully described and labeled in a field notebook and pictures are made. Then the fossils are wrapped and brought to a lab, where they are cleaned, made stable with more glue, and any missing parts are restored using putty. 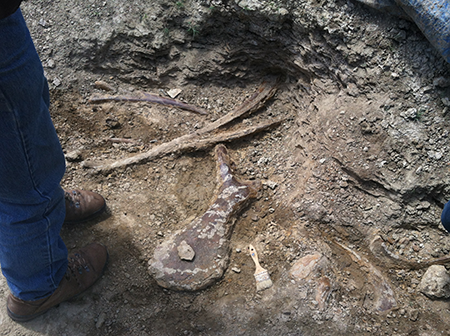 It is exciting to dig up dinosaur bones and defend the truth of God’s Word at the same time!